Come to Le Marché Gift Shop’s Spring Festival on Saturday, March 30 & Sunday, March 31st. Admission is free. 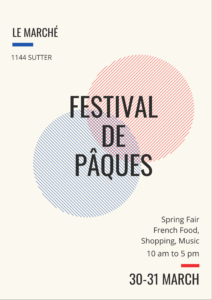 There will be French Food, music, and shopping. Cheese Raclette, Croques, Croissants, and Pâtisserie from Le Marais Bakery.